It’s about time that we get some lighthearted fun back into the hallowed halls of Grey Sloan Memorial Hospital. All of the doctors are finally getting to some sort of happy place with the beginning stage of the Surgical Innovation Contest — which is going to be fantastic to watch develop throughout the second half of this season. Whether it’s the current patients they are treating or the past still haunting them, this week is all about the inspiration behind some of the craziest, most innovative medical proposals you will hear. Grab your medical jargon dictionary because this episode is much more fun if you understand what each character is talking about. Almost every doctor is putting their hat in the ring for the first ever Grey Sloan Surgical Innovation Contest. There are plenty of insanely great ideas to go around, along with some interesting character pairings. The first stage of the contest is to submit your idea in the form of a research paper explaining every detail and how you plan to proceed if chosen for funding. Only a handful of proposals become selected to move on to the actual implementation stage, which will then be broken down into a smaller group, with an eventual winner given full funding. Since it’s really fun to watch how these ideas play out, I won’t say who is moving on. Instead, here’s a brief look at the applications: Richard uses an anecdote from Maggie to create a prototype magic cancer wand that can detect if tissue is normal or cancerous with one touch. Maggie wants to create a transcutaneous charger for LVADs and other heart-powering batteries. In layman’s terms, it’s essentially a magnetic battery pack that would work through the skin without any wires. Too bad she wasn’t around about twelve years ago because I’m sure Denny Duquette would have appreciated this idea. While Jackson comes up with sprayable skin, he ultimately decides to team up with his mother, Catherine, on a potentially game-and life-changing procedure involving transgender women. If that last sentence didn’t get your attention or make you at least curious about this episode, then I don’t know what will. Their proposal is more than likely going to turn into the most significant upcoming storyline. Alex, Amelia, DeLuca, and intern Sam’s proposal stems from their young patient, who has an inoperable brain tumor. This one is a bit hard to explain, but the idea is that if they can figure out the frequency of the brain tissue, they can excise the tumor with a high frequency rather than cutting away brain matter. Bailey is on bed rest following her heart attack from the previous episode, but don’t count her out of the contest. She has intern Schmitt playing errand boy for her project to create a better, easier colonoscopy. Owen’s research leads him to a dead end, and he decides to not compete. That leaves us with Meredith, Jo, Arizona, and Carina. I’m going to hit the pause button on the Surgical Innovation Contest recap for a moment because there is an underlying subplot to the episode that won’t be getting as much attention as it should. It’s easy to get caught up in the grandeur of the contest, so you might not have realized that April and Arizona have both essentially crossed over the crazy line. It’s been a few days since we last saw April giving up on her faith and having a fling with intern Vik. Well, this episode reveals a whole new side to April that I’m not sure anyone thought would actually exist. While I have always appreciated April’s unwavering faith and personality, this new I-don’t-give-crap-about-anything April is a lot of fun to watch. Her newfound snarkiness is pure perfection. However, there is a lot of cause for concern over her wellbeing. April tells Arizona that she can’t sleep without drinking a bottle of wine and is still sleeping with Vik because it’s convenient. This all stems from two episodes ago when April lost three patients in a day. Arizona is still messed up from that day too, as she can’t get over Matthew’s wife Karen’s shocking death. The events have led Arizona down a rabbit hole of all the previous new moms who have passed away under her care. Both characters are visibly mentally unstable throughout the episode. I was surprised at how fast this was glazed over because April and Arizona are probably in their worst places ever at the moment. There is a potential light at the end of the tunnel of darkness: Arizona and Carina team up to create a contest pitch about saving pregnant women with preeclampsia. April can at least distract herself with the duties of running and judging the contest, but this may be a bigger story that will be playing out for some time. If you haven’t realized, Meredith has taken Jo under her wing in every way that you can think of. 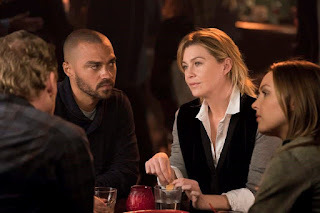 Whether it’s surgically or personally, Meredith has become very protective and supportive of Jo, which has been spotlighted over the first three episodes of the second half of the season with the Paul storyline. Meredith’s mama bear ways are definitely having a positive impact on their relationship, and they might even be the show’s new power couple. There have been other characters in the past that Meredith has been fond of, but her newfound relationship with Jo seems very different. They have had quite an arc over the years, and it feels like their true potential as a dynamic duo is just beginning. It shouldn’t be a surprise then that they are partnering up for the Surgical Innovation Contest. Remember that patient that Meredith had to blindly operate on without any blood bags during the technology hack during the midseason finale? Well, the patient is back and leads to some wonderful inspiration that has both Meredith and Jo drooling over the possibilities. The woman has multiple tiny spleens growing inside her from the flecks of splenic tissue that remained after her splenectomy. The discovery is totally insane, and it leads Jo to question why she couldn’t have grown mini more important organs like livers or kidneys. The major light bulb moment is should lead to some intriguing stories, especially because they might not be able to compete without buying the patent for a biopolymer they need to use for the study. Meredith and Jo work really well together, so my bet is that they will find a way to make it work. There is another big moment for their relationship in this episode that certainly shouldn’t be taken lightly. Meredith decides to put Jo’s name on the proposal with her own, making them partners. Not only does this make them essentially equals, but it also prompts Jo to take a big step in her healing process when Meredith says she can change her name on the paper. Jo decides that she will now go by Josephine Brooke Wilson, which is a huge step in the right direction for her. Jo is starting to accept her past and move forward, which is oh-so deserved.